So here we are 21 days to go to the big day, I absolutely love Xmas and everything that goes with it, Tradition, Carol singing, Turkey, Puddings, Playing with the kids toys and then falling asleep. The only thing ever missing here in good old blighty is the snow, Well it looks like I’m only going to get this blog started as it’s our local Xmas shopping night here and I’ve been chomping at the bit to get on with a blog for about 2 weeks! Literally haven’t had two minutes all week until now and it is literally two minutes I’m going to get, We have been so busy making new pieces and finally got round to photographing them all with a week of very late nights only for Black Friday to come round and then that was it – Eat – Sleep – Work – Repeat, Don’t get me wrong I want you guys to buy as much of our stuff as you like other wise I don’t have a job! I think we have managed to get five new products on in the last week so I have plenty to write about just no time to write it. Just had a look at the last blog more time has elapsed then I had thought, Better watch I don’t sleep through Christmas Day! OK so back in from the madness that is a late night Xmas shopping night, Only took a couple of hours! 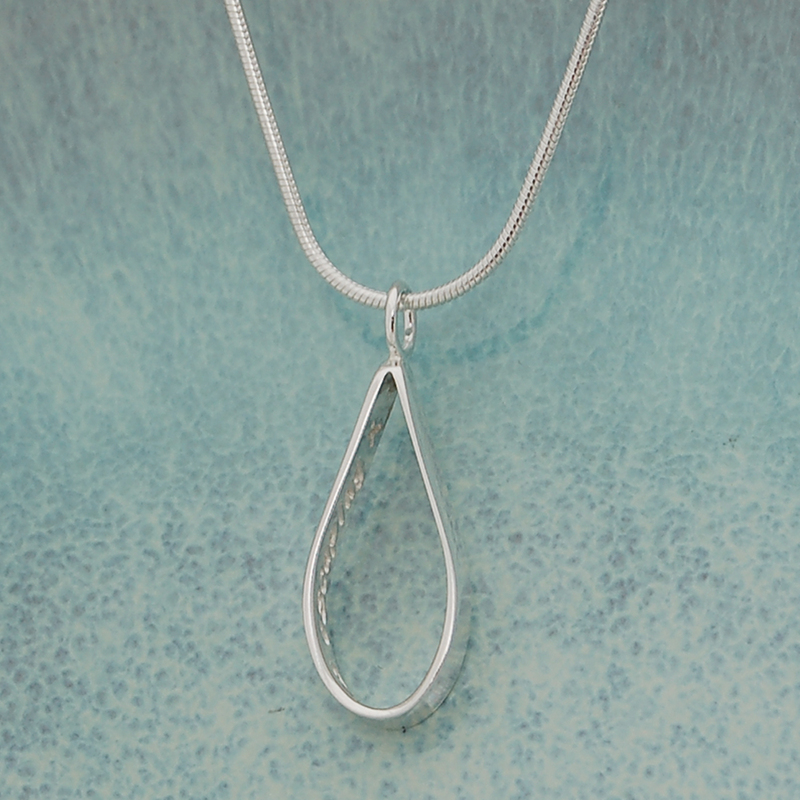 So let’s start with what I’m here for, Our new personalised sterling silver secret message droplet necklace We are always trying to expand our secret message range and we came up with a more simple design but nonetheless a cute little charm necklace. 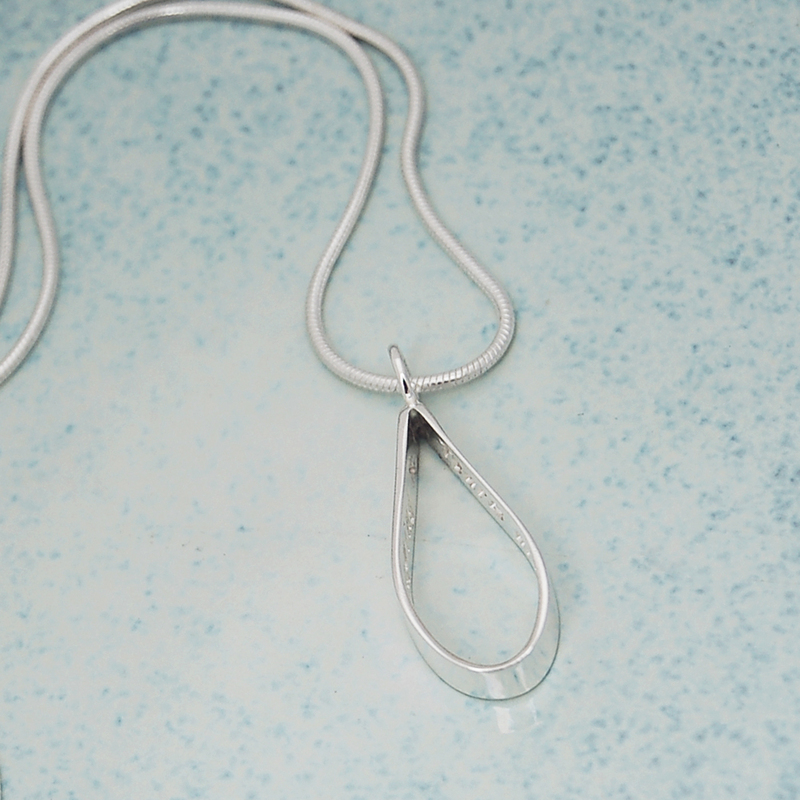 We have come to realize that sometimes simple is the best, Not everyone wants something extravagant so this necklace does the job. 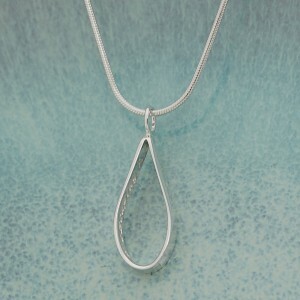 The dimensions for this droplet are 2.5cm and that’s from the top of the loop to the bottom and is 1cm wide, You get 30 characters and that includes spaces so it’s not the longest piece we have but that was the thought behind the design but as always if you wish to have it bigger then just contact us and we have also given you a few lines of text in the product description to give you a helping hand to start you off if you cannot think of anything. The hardest part of making this droplet was trying to solder the loop on, It can get a little frustrating lets say when it moves by the smallest of movements when everything is lined up and then you think maybe it’s time for an eye test in the new year! So I hope Black Friday wasn’t to stressful for you all, I have to admit I just dodge it all together I can never make up my mind what I want so best to have nothing I say then all the stress and save my pennies, Can’t go wrong really! Joking aside thanks for those of you who bombarded us with orders on Black Friday we really appreciate your custom, We can make things all day long but it takes you guys to make our business work so thanks. Well that’s that for today well tonight now I hope to be back with another new product shortly so don’t be like the rest be an IndiviJewel. So here we are three weeks into the school holidays and only four to go! How come this seems like the slowest time of the year lol. We just got back from a short break at the coast and well excuse me if I thought it was supposed to be summer, Rain, Rain and well more rain but the indoor swimming pool was nice! OK so haven’t been active on the blog front recently seems to have been put on the back burner of late so have a few to catch up on. 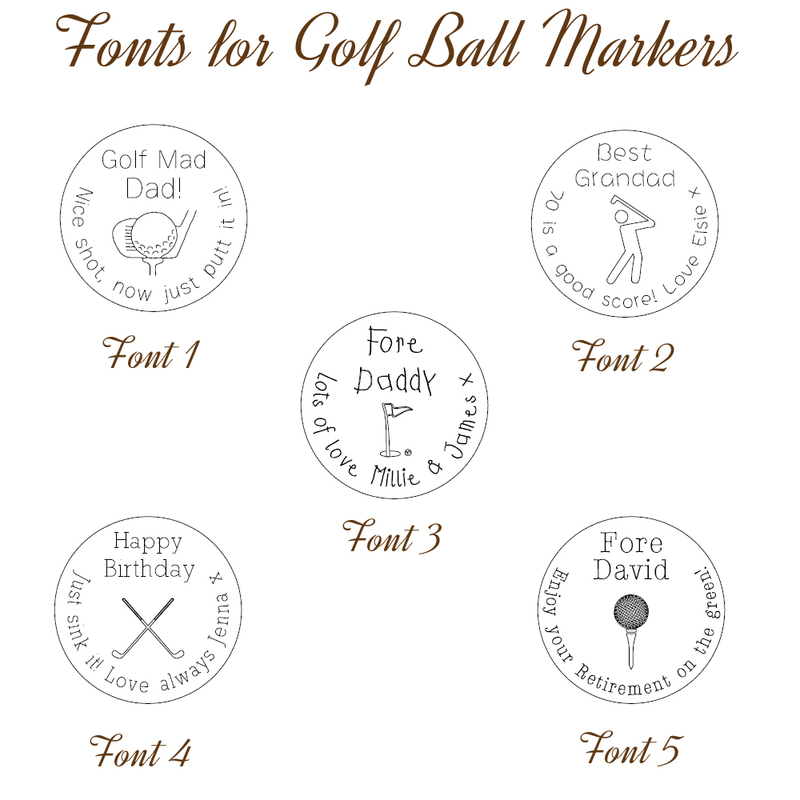 I wanted to start with our new personalised sterling silver Golf ball markers which we made especially for Father’s Day and which also proved to be very popular with you guys and gals. 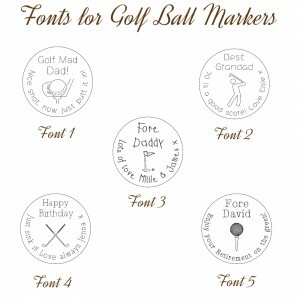 With summer here and a lot of the big Golf tournaments on around the globe Golfing accessories become very popular and mix in Father’s Day and it becomes very busy.These markers make a great keepsake for those Golf mad Dads, Grandads and not forgetting all the Mums and grandma’s. We have added five new designs which cover a wide range of images and layouts so there should be something for everyone although there is always room for more but will keep them secret till next year! 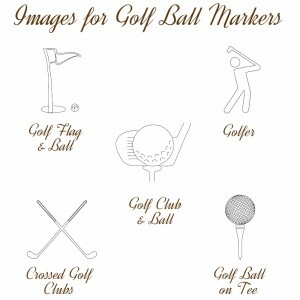 Just to let you guys know we do make custom designs with images that customers give us and we have made some really nice custom Golf ball markers so just a thought for you to think about if none of these ones tickle your fancy, I wish I had some photo’s to show but because we are always busy and in a rush we never have the time to take any, Well thinking about it my brain doesn’t actually work at the time! You know us guys we cannot multitask if we tried! I have to say these products are one of our favourites to make, We just love all the unique messages that come through to us, Love, Family, Funny ones, and even the rude ones yes we don’t hold that against anyone because we know that all the messages will be well received. OK so you should by now get the picture if your still reading this! 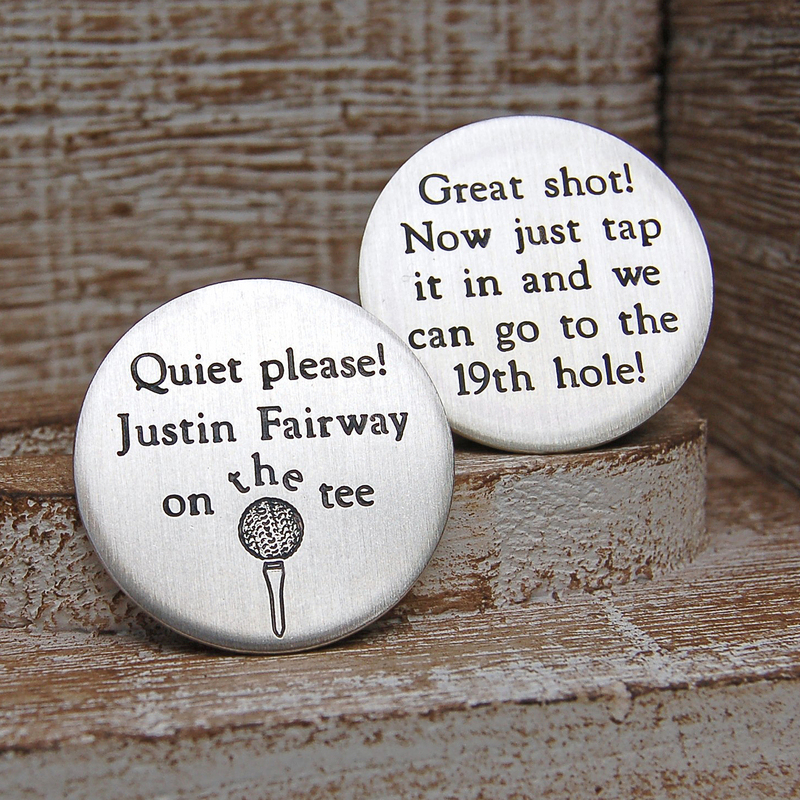 We make great Golf ball markers lol, Right it’s time to take the dear cherubs out to burn some energy off so don’t be like the rest be an IndiviJewel – Really like that line although when I read it to myself it does sound cheesy! Well here we are! Sunday morning still half asleep, Kids playing on the Wii and I’m writing another action packed blog LOL. 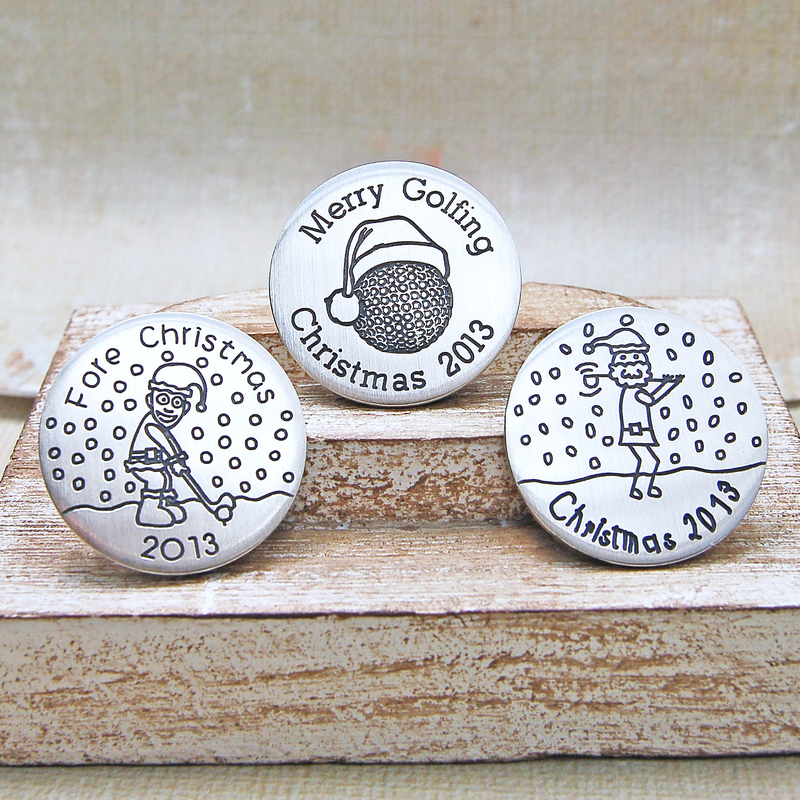 We have been making our unique and exclusive personalised 2013 Christmas Golf ball markers for the last two years and this is our 2013 edition which we think are the best to date. 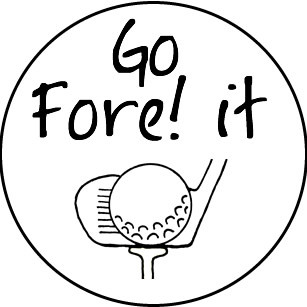 I would love to make myself one of these but fortunately for other Golfers I couldn’t hit a golf ball for toffee as the saying goes! 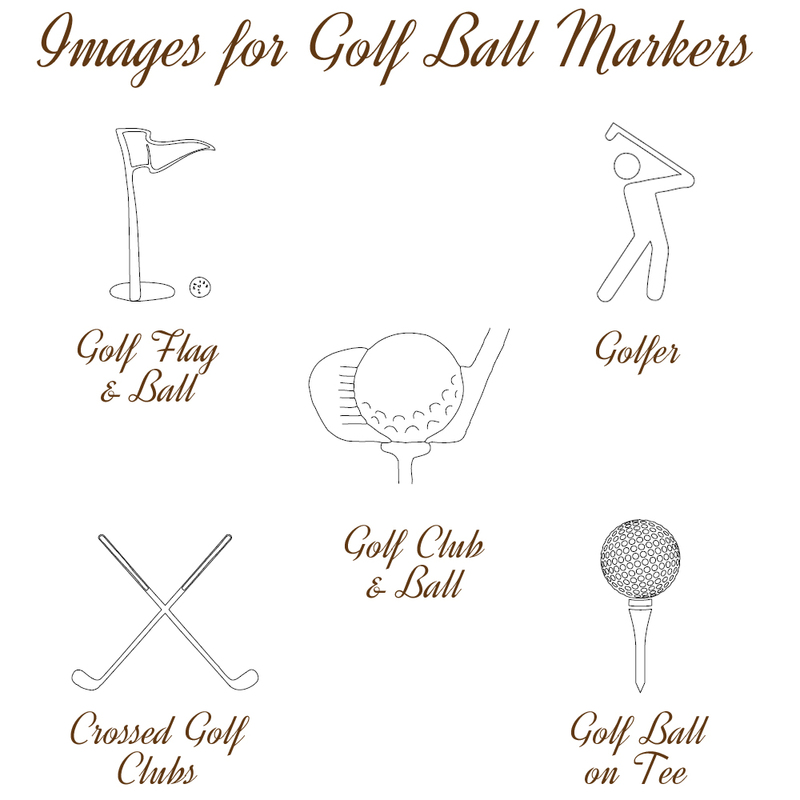 As most of us know Golf is a hugely popular game world wide for men and women so there is a big market for Golf accessories. We didn’t really think they would sell the way they have but we actually love making them and they sell really well. We are constantly designing new ones and trying to push the limits of what you can put on a small disc. They make lovely little gifts with that personal touch so everytime golfers use them the thoughts of that person/persons come to the fore front, Weather it be from the kids, Wife, Girlfriend, And so on. As you can see in the photo we have given you a choice of three designs. We have one with small children’s writing font, A second font which is also a child’s font but for the older kids and a third one which is more of an adult font for adults to give to other adults. So if you can’t find your loved one a special little gift you won’t go wrong with our novelty markers with that personal touch. Just for some other IndiviJewels news we have moved into our new workshop so really looking forward to next year as we have tons of new designs to make as we haven’t made that much this year due to making sure the company had a good structure so lots of behind the scene stuff going on which is nearly over! Just waiting for the new website and on to bigger and better things. Is it just me or do the weeks just seem to be getting shorter? I can’t believe Christmas is just around the corner again! As usual we are working on so many different projects when Christmas comes around, It’s unreal how we always do this but Hey-Ho there we go. Best news of the week is that our new workshop is ready to move into WOO-HOOOO. It’s all kitted out just have to find a home for all me bits! And there’s more good news regarding the new website, It’s moving in the right direction now- Forward LOL that’s due to the fact that we are no longer involved LOL. Anyhow as you can see by the title of this blog we have added another unique personalised Golf ball marker to our ever growing collection. I do have another one to show soon just waiting on the photographs and we our currently working hard on making our annual Christmas ones which I have to say look even better than last years if I do say so myself. 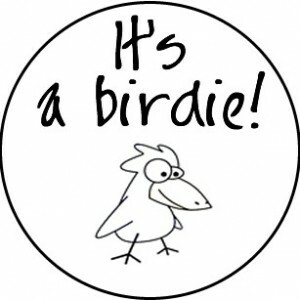 Right back to this particular Golf ball marker, If you like watching Golf ( Couldn’t hit a golf ball with a cricket bat!) like I do then you will know where I’m coming from with this one if not then what happens is when the Golfers are on the first hole there is an anouncer who calls the player up and tells the crowd to be “Quite please” Rory Mcilroy on Tee. We are always looking to expand and better are range of markers and as I was watching I just thought what a good new idea so here we have it simple as that! We always like to put some sort of Golf pun or reference on if we can so it took us ages to think of something but do you get it? The name Justin Fairway? As your driving off the Tee you want to get it “Just in the Fairway” come on now that’s funny, Go on have a chuckle lol. Well haven’t I fallen into bad habits again!!! It only felt like I was off on my Short break to the seaside and here we are two months later at winter’s door. So the website is coming along nicely, We got the first page designed WOO-HOO, lol, Anyhow as you guessed by the title this blog is about our new and unique collar stiffeners which we are more than happy with. Over the last year or so we have had those deluded people who call themselves Jewellery designers but infact what they do is just copy other peoples hardwork and then take all the rewards (Still thinking about taking legal action) Yes we all know them folk, Anyway that prompted us to think about living upto our name IndiviJewels so we set about designing something new which just happened to be these Beautiful,Elegant,Treasured Collar stiffeners yes I could go on! Nothing like pumping up your own work lol. 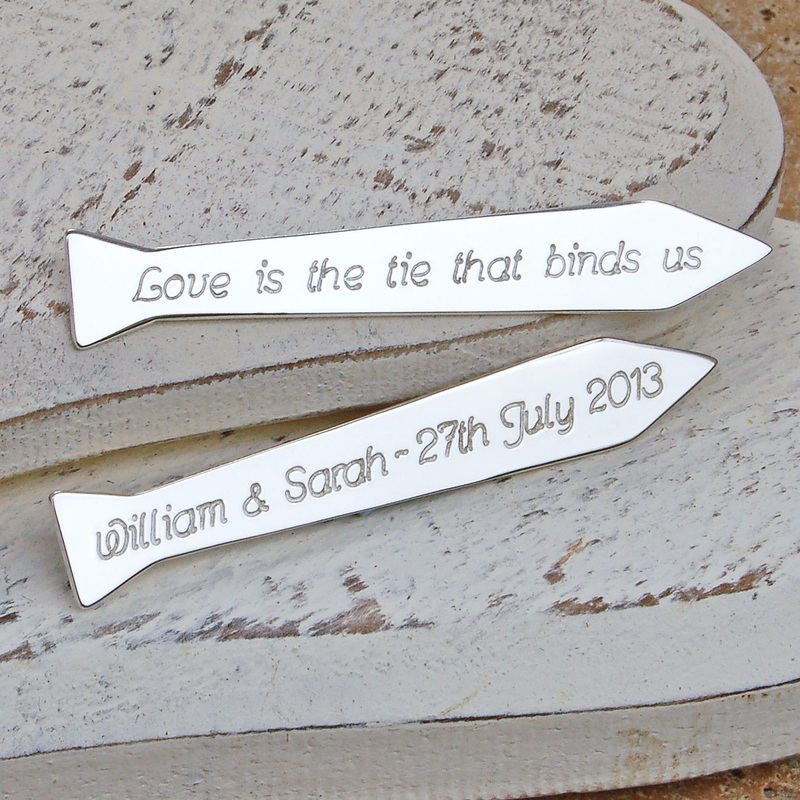 Obviously you are pretty limited to what you can do with collar stiffeners due to the shape but we happened to come across the idea of tie shaped stiffeners and then found no end of tie puns which give us the idea for the stiffeners. 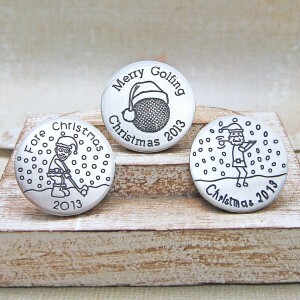 We have been working away like Santa’s little elfs trying to get these made in time for Christmas. 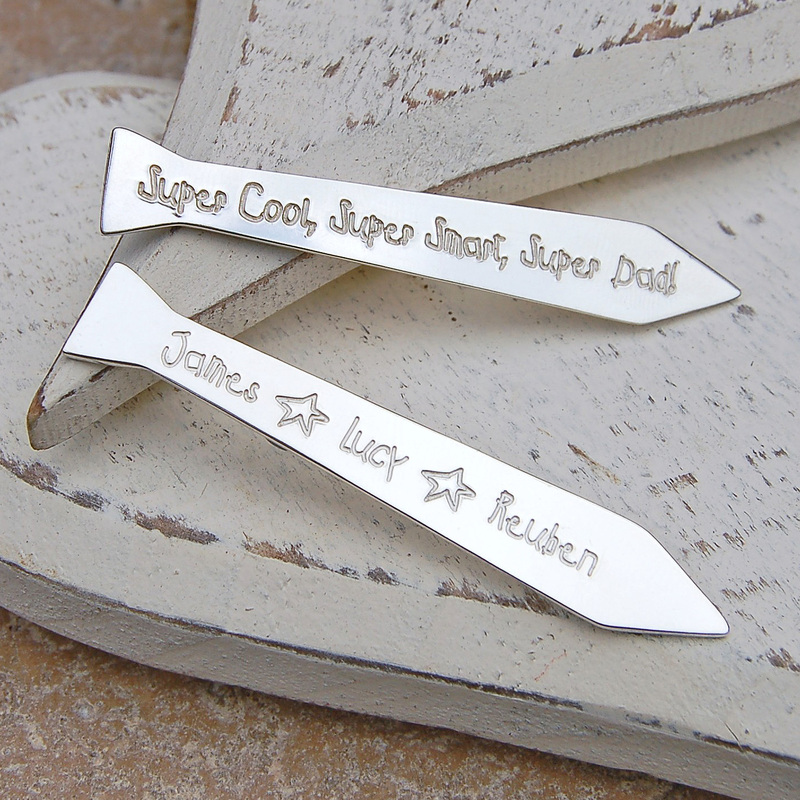 Anyway the end result is we are over the moon with these collar stiffeners, Sets us apart from everyone else which is how we like it and gives IndiviJewels another unique and exclusive design which is OURS!!! We have made Cufflinks and a very cool tie slide to make up a wonderful range but that’s for another blog. I cannot tell you how hot it was in the workshop today! And cannot believe how hot it still is, I’m melting away at the computer writing this blog. 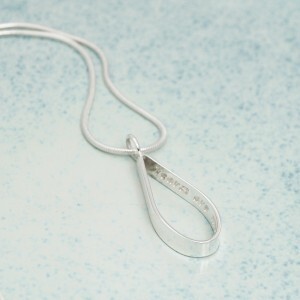 Well I’m going to blog about a customer we had last week that was asking for a Hebrew initial on our personalised initial necklace which was quite exciting (I’m very sad) as we haven’t used any other language other then English so I was intrigued to have a look at Hebrew text which looked so Alien to me as I have never seen it before, Need to educate myself more me thinks! I wasn’t sure how it would turn out as the letter was very thick in places so it was a test of my etching skills to get it right. I really enjoyed working on something a little different and hope very much to do other languages in the future just need to get my website out there into the big wide world! I forgot to take a picture when I made it (Doh!) but this is the letter M that we etched, this is my print out version for transferring to silver. OK feel I need to get on with some serious blogging as I’m getting to far behind so here I’ am “Mr Sadurday nite” yes thats right SADurday nite and welcome to my madhouse, a screaming baby and a very loud toddler wanting to play my computer games and one mad hound stoating round the house looking for dropped food lol. Well I’m blogging for a reason tonight and its to write about another new piece which is our personalised silver rings bracelet. Our other rings bracelet with the gold and silver rings has been a great success but we had quite a few enquiries about an all silver one as not everyone likes gold. I had planed to put both bracelets on at the same time but due to lack of time, yes I know someone get the violins out! lol and lack of certain stock items I couldn’t get it on until now. Somethings you really do like to make and I love making this bracelet, its just so unique and something different to all the other bracelets out there that just look so similar to each other. 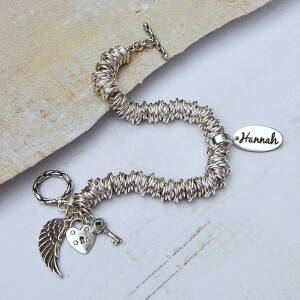 I have added one new finding which I will add to the other bracelet which is the charm holder which looks fantastic on this bracelet and to me just completes it. I couldn’t believe how hard it was to find a charm holder, I did plan to use this in the original design but just couldn’t get my hands on one. If I wasn’t a bloke I would love to wear this but people might think I’m a big girls blouse as they say which there’s nothing wrong with but I have a reputation to pretend to have lol. Will have to look into designing a manly version! OK back onto the subject matter. The good thing I like about this bracelet is the person detail you can have on it, A name of a loved one or a special date in time that means so much. My favourite is inspirational words because my niece is at university and for her last birthday I made her a gold and silver rings bracelet with three charms which had the words believe,dream and inspire just to give her a little boost when she finds it tough going. OK that’s enough waffle from me at the moment. Well here we are again! Tuesday morning and just managed to get the little one off to sleep so thought I would grab my chance to jump on the computer and write one of my rare blogs these days. I’ am struggling to get my eyes to open today its funny how you get days like that. 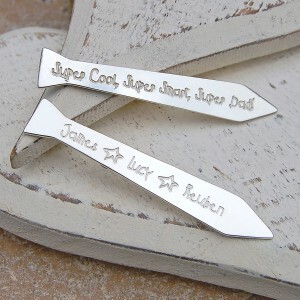 Well time is a wasting so let me crack on with our new personalised piece before the little one wakes up. 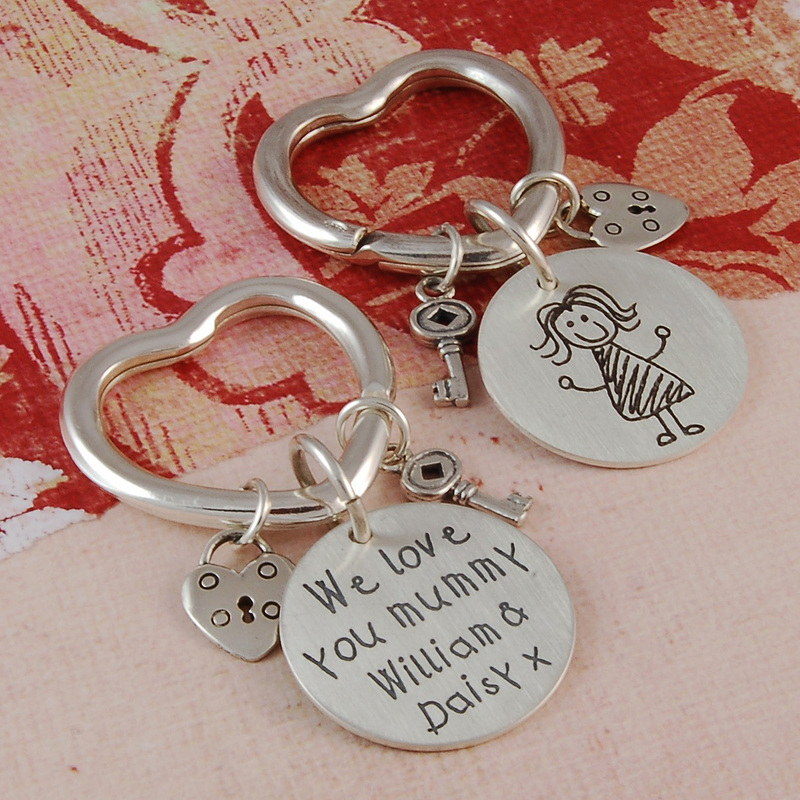 We have had great success with our Mummy keyring that we have made a family love keyring. 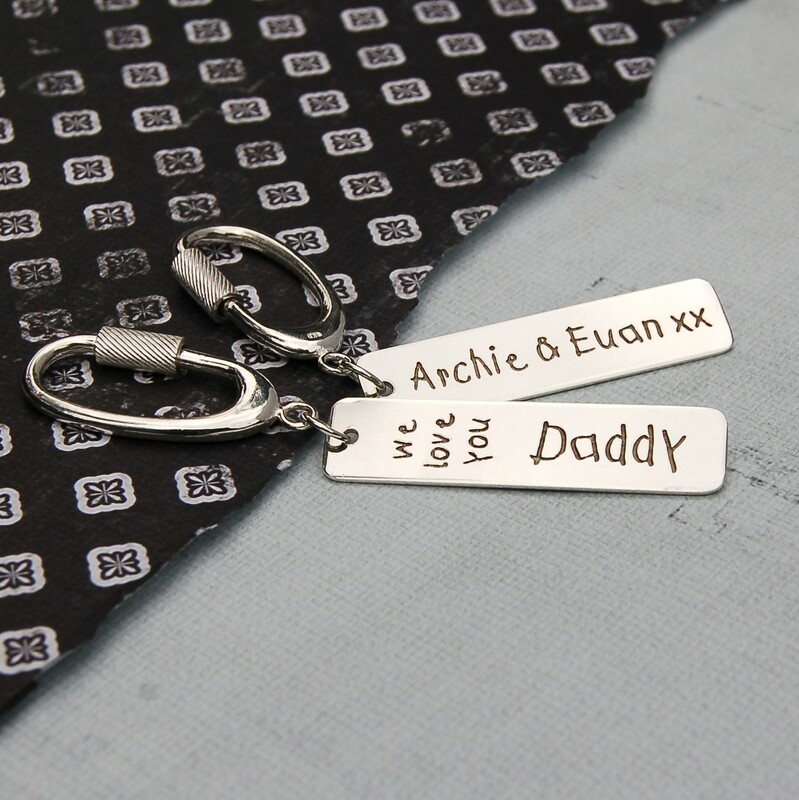 As its father’s Day this weekend we made the mock-up with a Daddy message but this keyring will be for anyone and everyone, family,friends, and maybe even work colleagues if you like them lol. Everything on this piece is sterling silver, the actual keyring is a beautiful solid silver oval screw shape, thought I would just add this as it seems some people use stainless steel key- rings with a silver tag but make out that the whole thing is sterling silver which isn’t the case with us. We have cut out a piece of shaped silver from sheet which measures 50mm long,10mm wide and 1mm thick so its a nice sized piece of silver to work with and get the text that we wanted on it. As you can see from my expert photography the two key-rings look like a pair of scissors lol. We tinkered with the idea of adding a charm or two but thought against it in the end as we feel it looks just right on its own and in proportion to the keyring so for this one it was best decided to leave well alone. Well as we come to the end of another busy week it feels like I have more projects than when I started with LOL. We have been working on our new personalised piece which is the Mummy keyring which we are very happy with. As usual we are always playing catch up with different occasions through out the year so we were determined to get this out for mothers day. It took a few attempts to get the drawing of mummy but you have to be patient with etching as it can go wrong and can be very time consuming. We used a 30mm Heart shaped split ring which weighs 8.50 grams and is a solid piece of sterling silver. We thought Hearts and Mums go hand-in-hand so with Mothers day round the corner we thought this would make a great unique gift for mums the world over. The sterling silver disc is 26mm in diameter and is 1mm thick. We have given the option of having up to 40 characters in a child’s first print font so plenty of room to fit those precious words for mum. As an option for customers they can have a child’s drawing of a mummy which looks great and just completes this piece. The keyring is finished with a couple of sterling silver charms which are a key and a locked heart which we think adds to the theme of this design as you can see in the photograph below. We also applied a satin finish to keyring as it helps prevent scratching and keeps the piece looking better for longer. I look forward to completing the rest of the family, probably next year LOL. 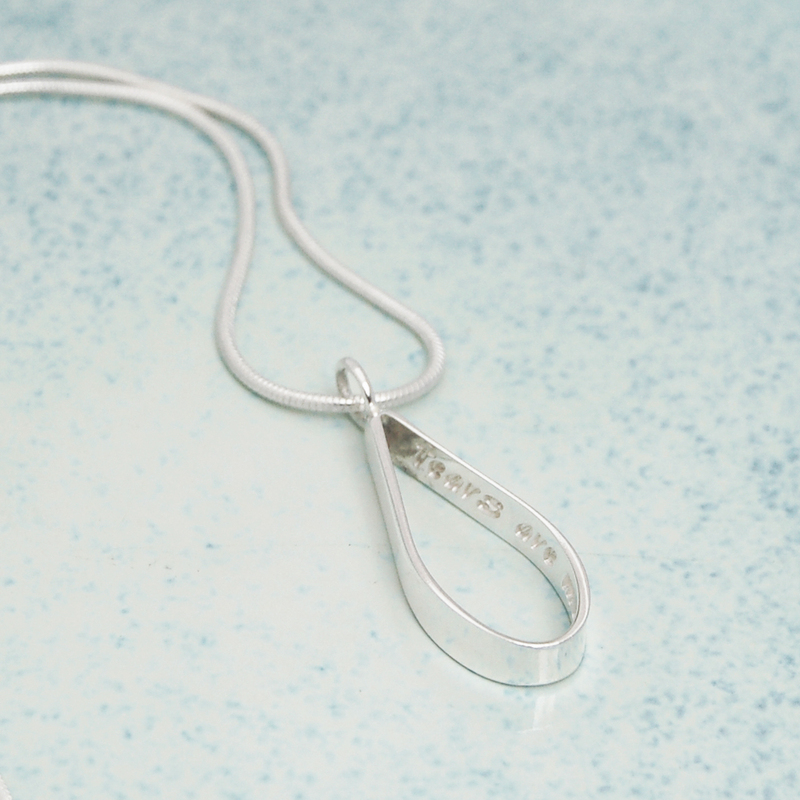 This is a beautiful gift and a wonderful keepsake for mums old and new. Just a quick update on our newest product which is our Golf ball marker. We have added some new designs that can be etched on to these fabulous keepsakes. Time is not on our side at the moment with our new son so jobs are taking a little longer than planned but we will get there. 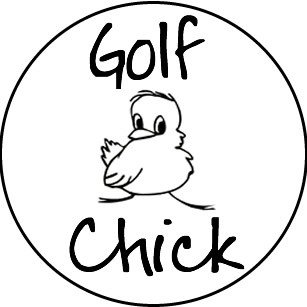 We have not forgotten the girls as we have this lovely golf chick marker. 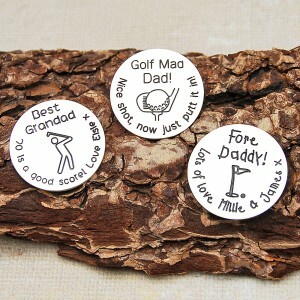 We have really enjoyed designing these golf markers, They make such a treasured keepsake and a unique gift. Let's be friends and keep in touch!